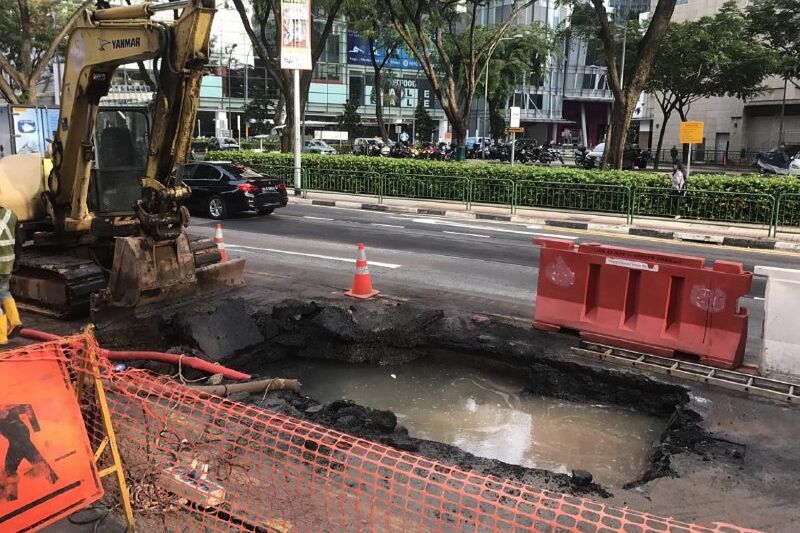 SINGAPORE - Somerset Road was partially closed on Tuesday morning (Jan 16) following a pipe leak. National water agency PUB said it received a report about the leak at about 12.40am. It sent service crew and contractors to the location at 111 Somerset Road, where TripleOne Somerset is, in front of an open Urban Redevelopment Authority carpark. In a Facebook post at 6.41am, PUB said that three out of four lanes along the road were closed for repairs. It updated its post at 7.59am to say it had isolated the leak and that only one of the lanes remained shut. 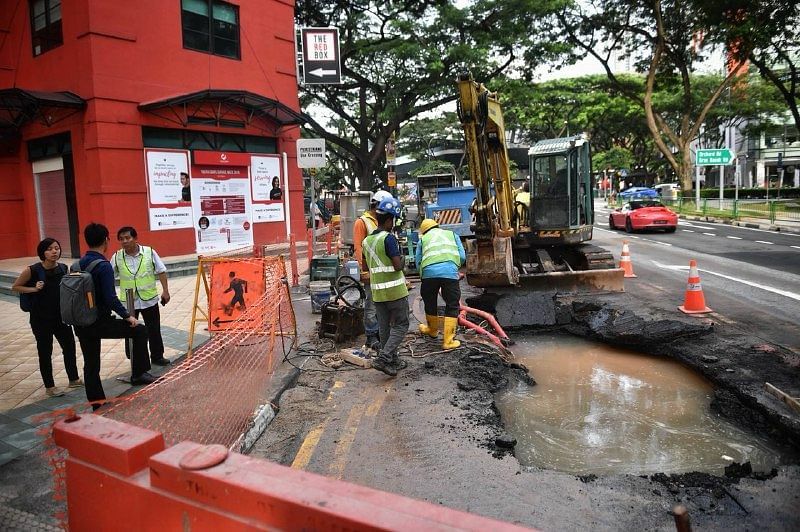 In an update around 7.30pm, PUB said repairs are expected to be completed and the remaining lane opened by early morning on Wednesday (Jan 17). 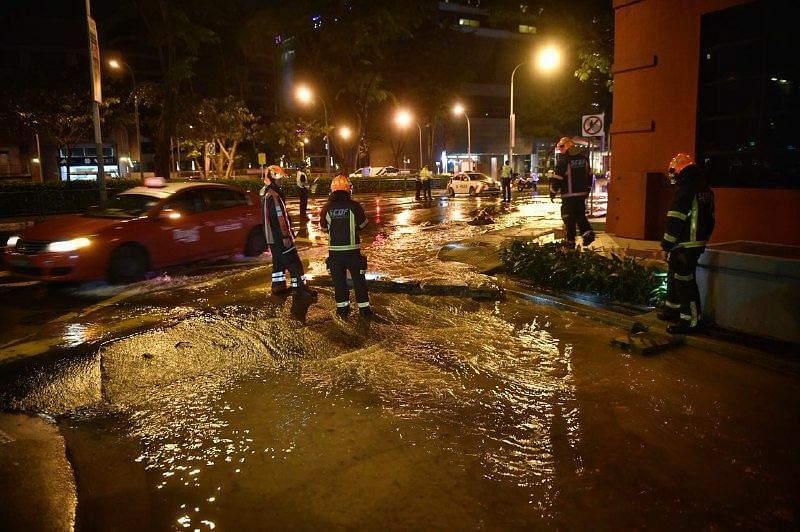 Temporary supply connections to nearby buildings were also set up to ensure that water supply to them was not affected, it said. At about 2am on Tuesday, police officers were seen directing traffic along the road. Parts of the road appeared to have sunk. The water supply to The Red Box located nearby has also been cut since about 4am, said Mr Terance Domnic, 56, a security supervisor at the building. "We don't have water supply at the moment. They cut off the valves to fix the pipe. For now Red Box staff looking for a toilet have to go to *Scape," Mr Domnic told The Straits Times at about 10am. He said that PUB was working to link the pipes in the building to a nearby fire hydrant, so that water can be supplied to the building while repairs were being carried out. 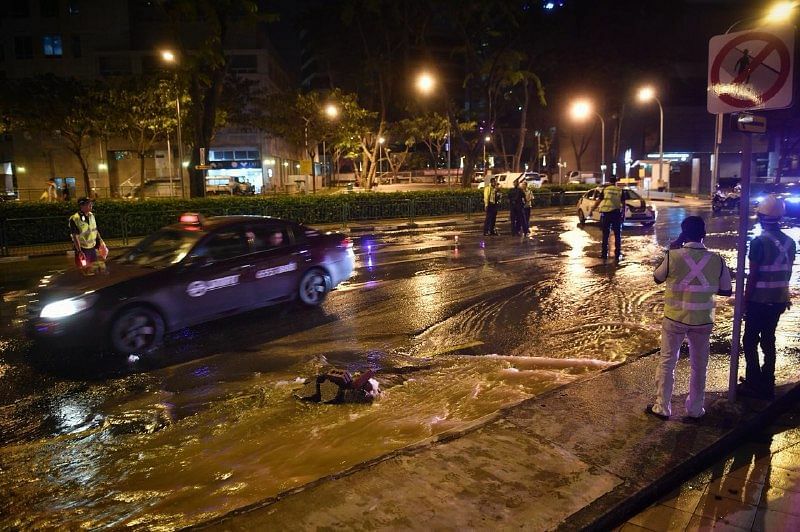 Mr Domnic said that the outdoor carpark in front of The Red Box was initially flooded after the incident was reported earlier, but the water subsided by the time he got to the location at 4am. "It was very muddy," he said of the carpark. The water supply to the Pan Pacific Serviced Suites along Somerset Road was also cut from the second floor and below in the 16-floor property, according to maintenance staff. Pipes in the property also had to be linked to a nearby fire hydrant to temporarily provide water. Commodities trader Rodney Fong, 31, who has been working in TripleOne Somerset for over a year, said he has never seen such an incident occur along Somerset Road. "Traffic (along the road) is usually smooth flowing and not heavy. It's a good thing because now that such a road closure occurs, it isn't affecting (traffic) much," he said. Members of the public can report any pipe leaks through PUB's 24-hour call centre on 1800-2255-782.